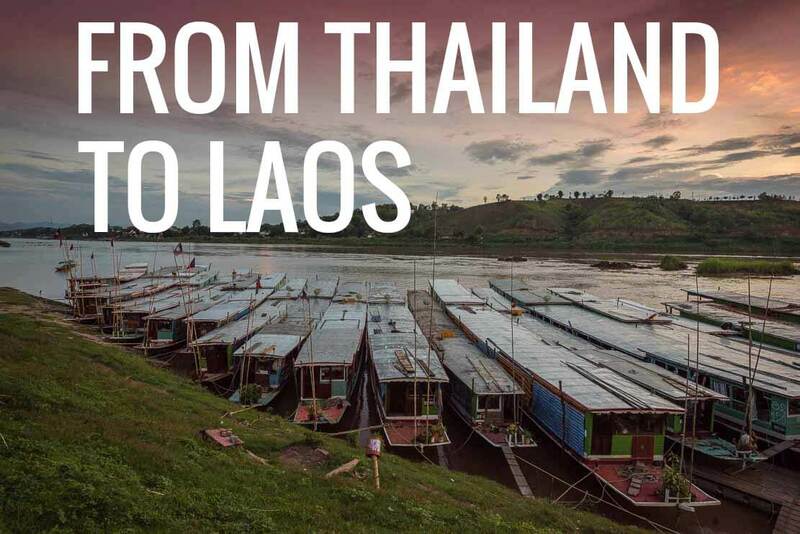 If you want to spend some time in the northern Thailand and then visit Laos, if you are looking to travel from Chiang Mai to Luang Prabang by slow boat on Mekong river, there is now a new and very efficient way of border crossing. 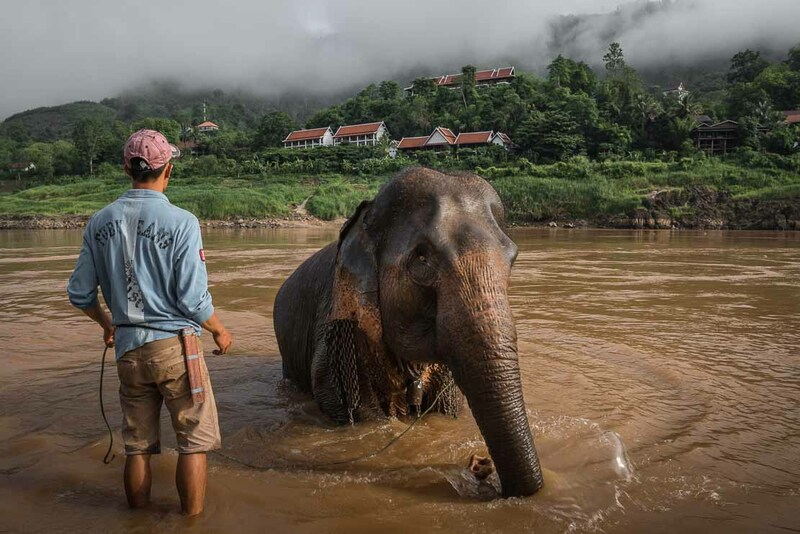 How to get from Chiang Mai to Laos? After having analysed the options to go from Thailand to Laos, and more specifically, from Chiang Mai to Luang Prabang, we eliminated the plane (too expensive), speedboat (too dangerous) and bus (too long). We were left with the slow boat option. Direct bus from Chiang Mai (8h). Bus from Chiang Mai to Chiang Rai (3h) and then another bus to Chiang Khong (2.5-3h). Buses are running every hour from early morning till mid-afternoon between Chiang Rai and Chiang Khong. This is the fastest option despite the bus change. Private minibus offered by travel agencies and guesthouses in Chiang Mai. The easiest but more expensive option. As we were already in Chiang Rai, the second option was perfect for us. We spent a few days in Chiang Rai visiting two unique temples, and we mentioned to our guesthouse host about our plan to cross the border to Laos. We were so glad we did. As it happened, there is now a new way to cross the border by using a direct bus from Chiang Rai to Huay Xai. 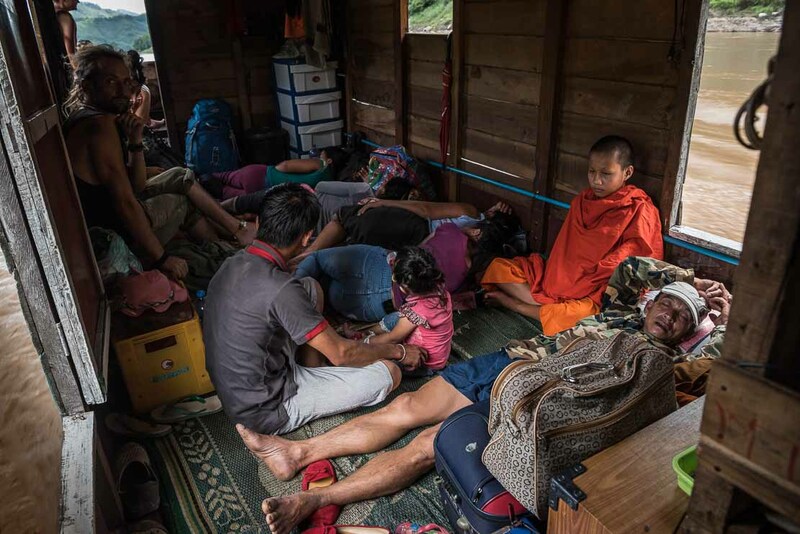 It’s no longer necessary to go Chiang Khong to cross the border. 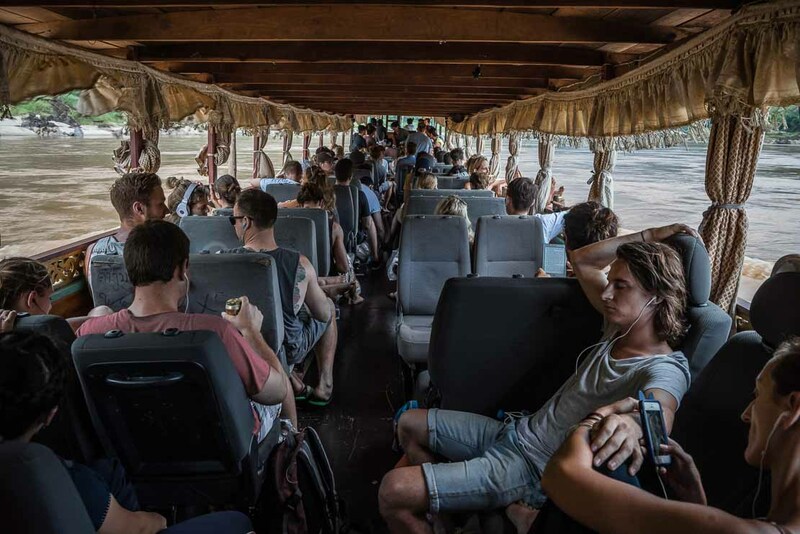 There is now a direct bus from Chiang Rai that goes all the way to the Thai-Lao border, drops the passengers who need to obtain a Lao visa on arrival, waits for them on the Lao side and then goes to the Lao town of Huay Xai. Despite quite a high price (220 baht), the advantage of the direct bus is that there is no need to change buses and pay several tuk-tuks. At the end, it may well come down to the same price. This option was a saver for us. We didn’t have to carry our heavy luggage (once again, all blame on Olga’s photo bag), to change the buses and to negotiate tuk-tuks. Easy and efficient. 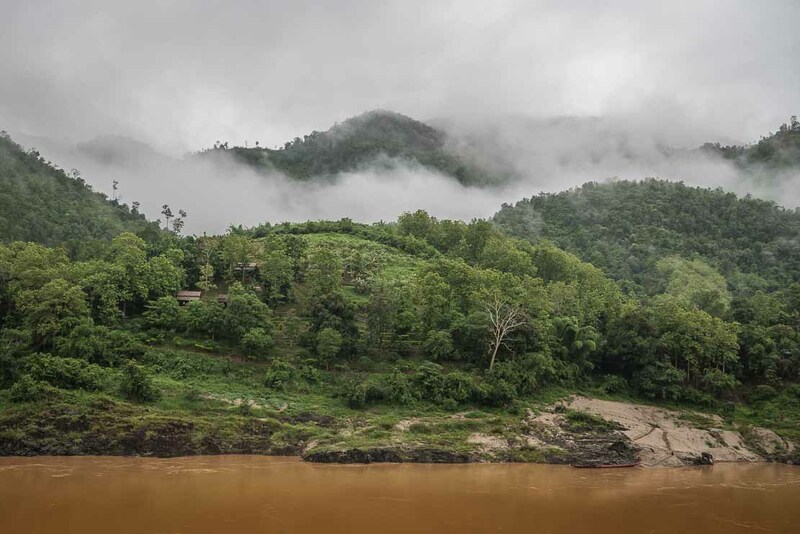 The border towns of Chiang Khong and Huay Xai face each other across the Mekong River, and both have ample accommodation and restauration options. 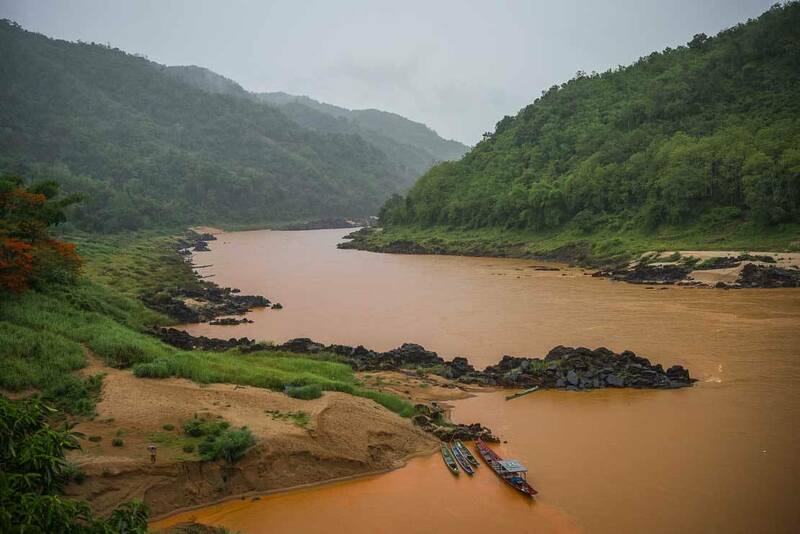 Mekong is the 12th largest river in the world. It starts on the Tibetan Plateau, flows through Yunnan province in China, passes through Myanmar, Laos, Thailand, and Cambodia before forming a large delta in Vietnam and flowing into the China Sea. 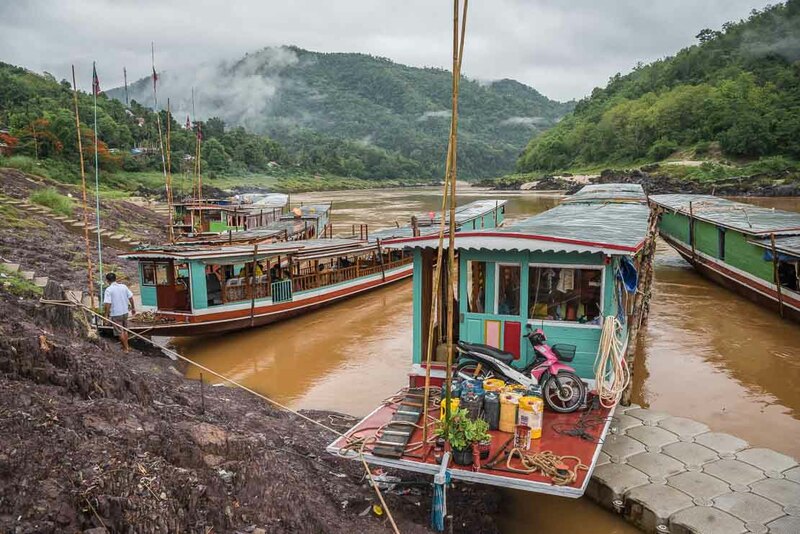 Travelling on Mekong from Thailand to Laos by slow boat is a two-day trip via a stopover for a night in Pakbeng. 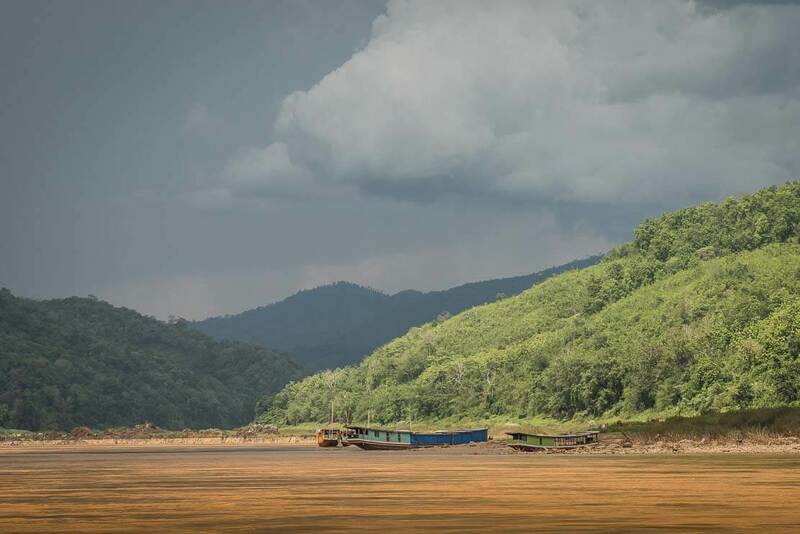 Taking a slow boat is a popular way to travel between Huay Xai on the Thailand-Laos border and Luang Prabang. 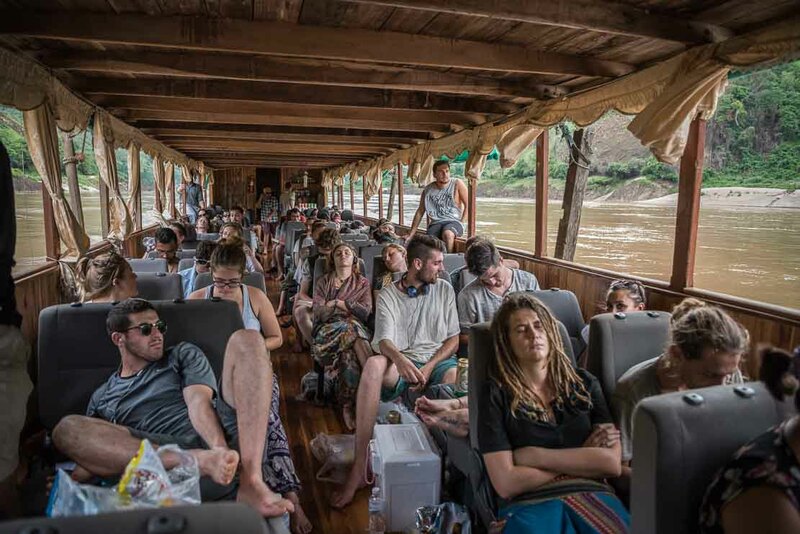 It’s on a bucket list of many backpackers providing a cheap way to travel on Mekong instead of taking an expensive Mekong river cruises. It’s not possible to leave Chiang Rai early enough to get a slow boat on the same day. You have to stay overnight in Chiang Khong or Huay Xai. 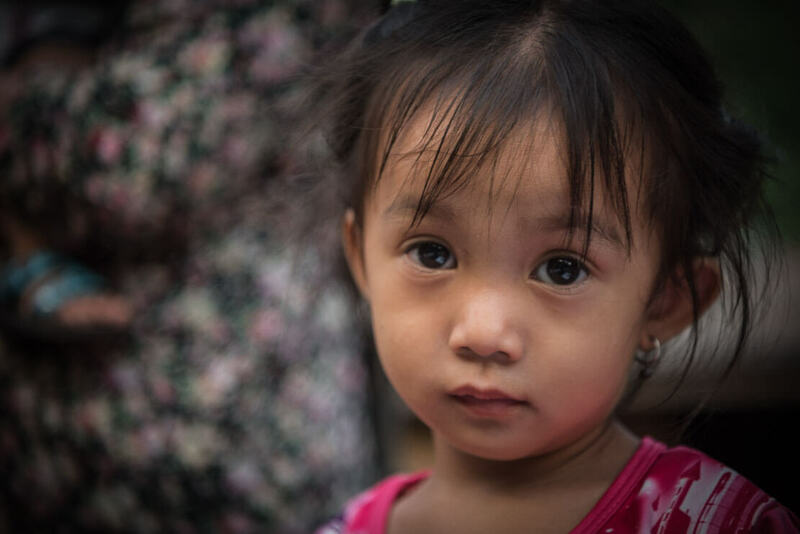 In our case, we spent a night in Huay Xai, a little town located on the banks of Mekong river. 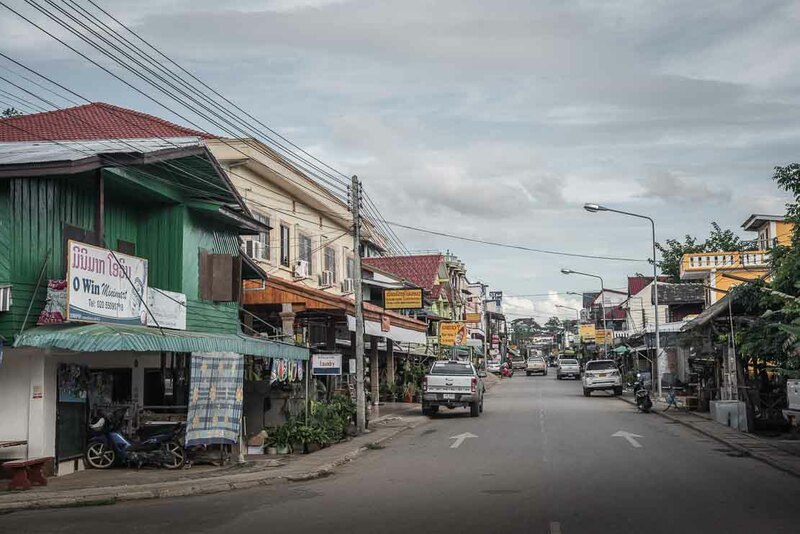 Its main street is a row of guesthouses and restaurants catering for tourists coming here to take a boat to Luang Prabang. 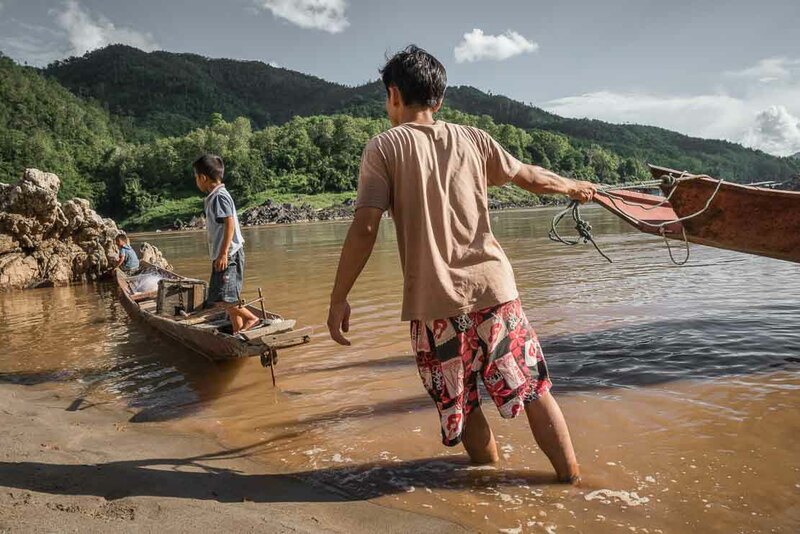 The life in Huay Xai navigates around the boat business – every man, dog, and guesthouse sells boat tickets. However, the official ticket office at the small wharf is the most reliable and a cheaper way to buy a boat ticket. We read about the boats being overcrowded. Just the reminder of our trip in Mali all the way to Timbuktu on a small overloaded boat made us jump from the bed in the morning so that we could arrive early enough to reserve our seats. Even if the boat was going to be overcrowded, at least we have seats in the front, and not in the rear. The perspective of having the diesel engine with the fumes as our closest neighbour wasn’t very appealing. 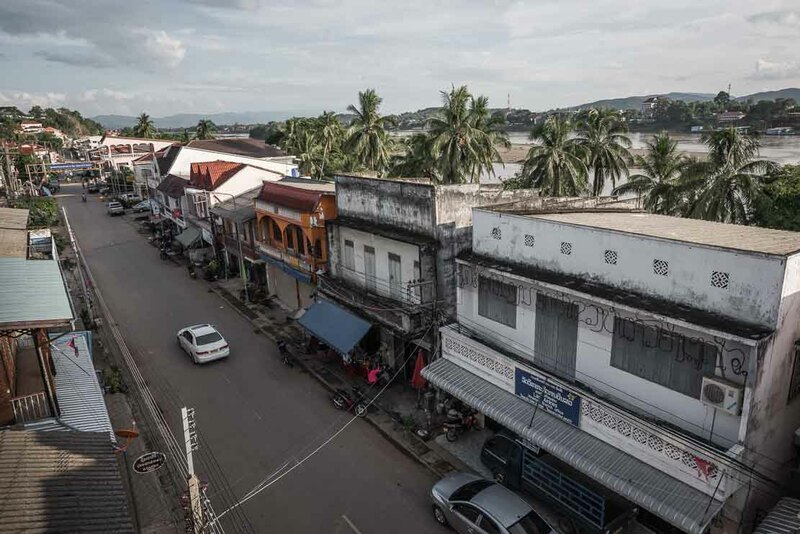 Huay Xai, a small port town on Mekong. Departure point of slow boats to Luang Prabang. We arrived at the wharf much ahead of time. However, our suspicion was confirmed – the boat departed 2 hours later. 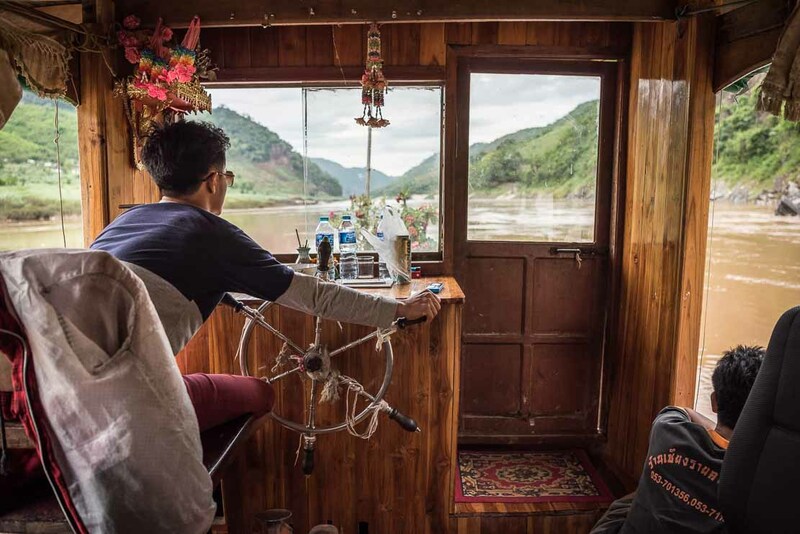 We read some stories about the slow boat trip that make you think twice about this adventure. Stories about boats being overcrowded, hard seats for 7-8 hours of journey, unexperienced or careless boat drivers, crazy rapids, capsized boats, people getting too hot, people getting too cold, people giving birth and even dying on the boat etc. But our experience was the opposite. 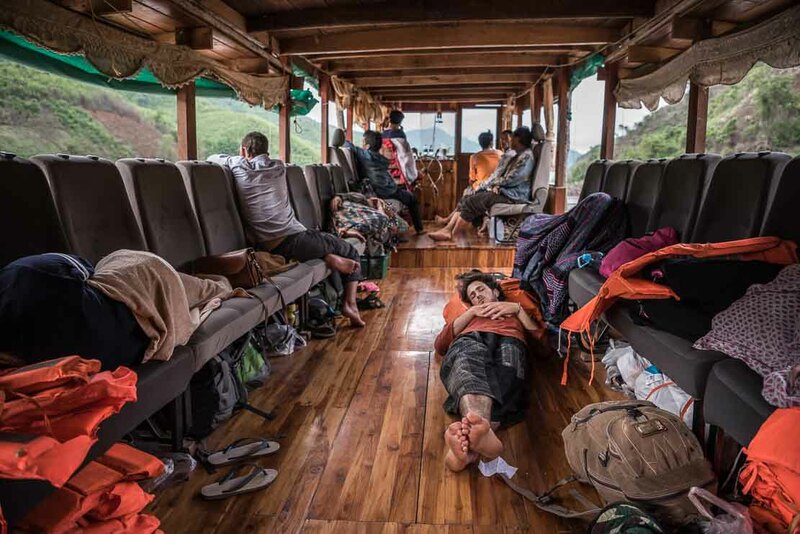 The slow boat journey down the Mekong was comfortable and beautiful. Our boat was full but not overcrowded, the seats were not wooden and hard but soft ubiquitous upholstered car seats very popular in Asia, the driver was skilful and the rapids were smooth, and the weather was perfect. Our only complain – beer Laos was outrageously expensive on board. 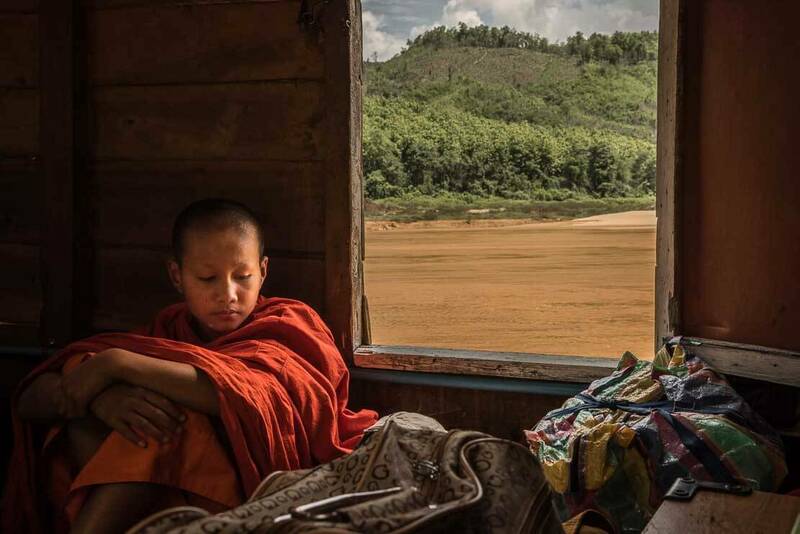 We had our Kindles with us planning to read along the way but we ended up contemplating the view – the green surrounding jungle, mysterious mist, occasional tiny hill tribe villages half hidden behind the hills, children playing ashore, passengers getting on and off from time to time, including the monks in their bright orange robes. It was a peaceful and pleasant journey despite some young backpackers occasionally throwing an impromptu party with countless bottles of beers that they have cleverly bought in town. The locals make a whole business out of it packing the beer in special cool boxes. Sometimes it was hard to say what was making more noise – the thrum of the engine or happy and a bit tipsy backpackers. The hours passed without us really noticing it and we arrived for an overnight stay in Pakbeng. 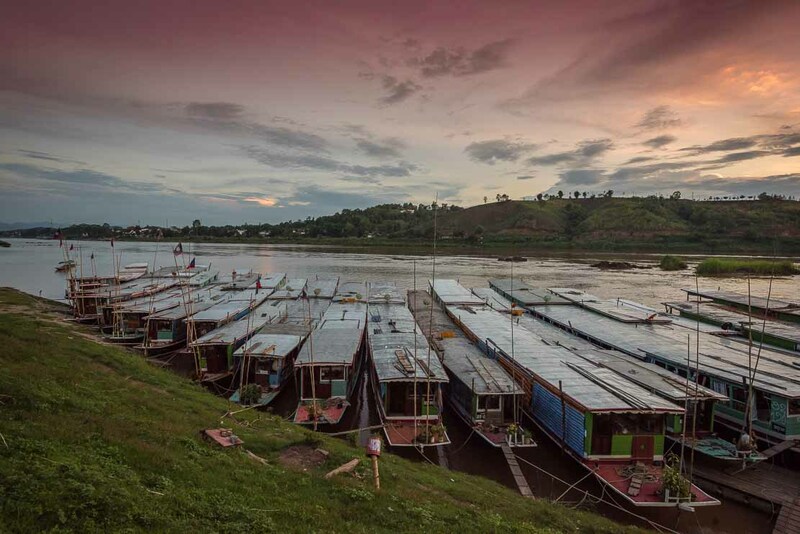 Slow boats don’t travel the Mekong after dark. 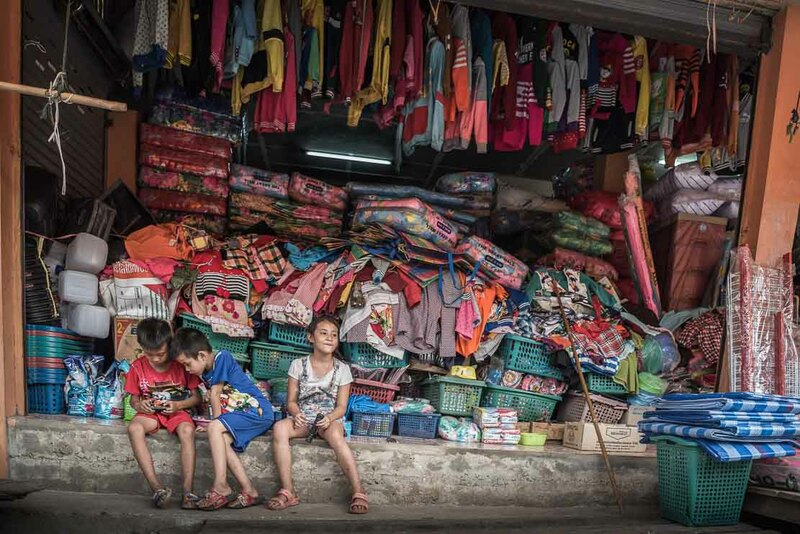 Pakbeng is a small but bustling port town on the Mekong river located roughly halfway between Huay Xai and Luang Prabang. 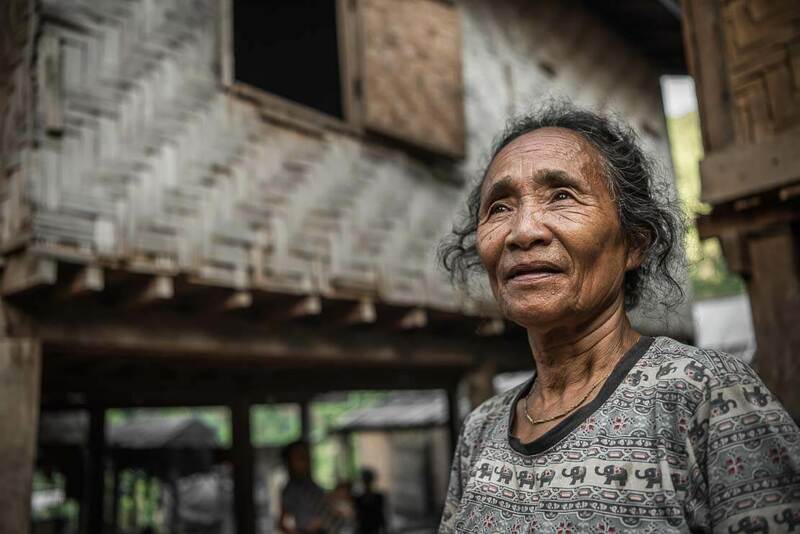 Pakbeng is an interesting place. 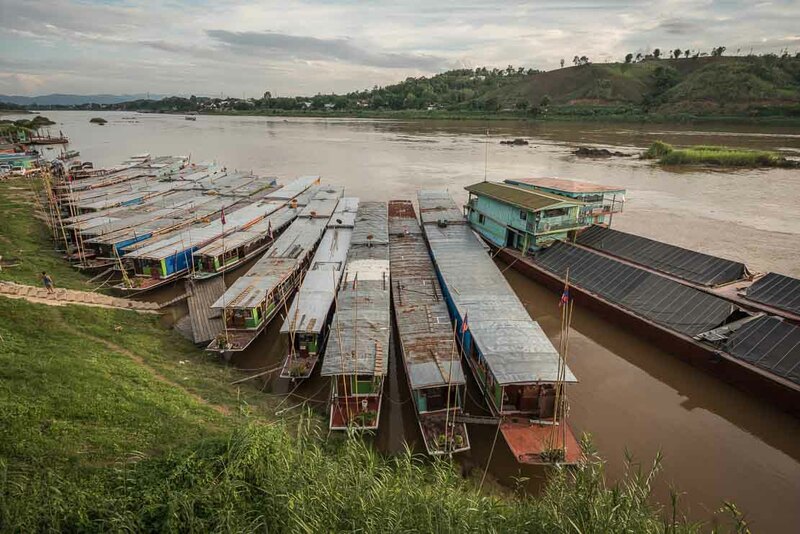 With Mekong being the major transport route between Thailand and Laos, Pakbeng, once a poor and unknown town, has developed as a popular overnight stop for boats, transporting passengers and cargo in both directions. 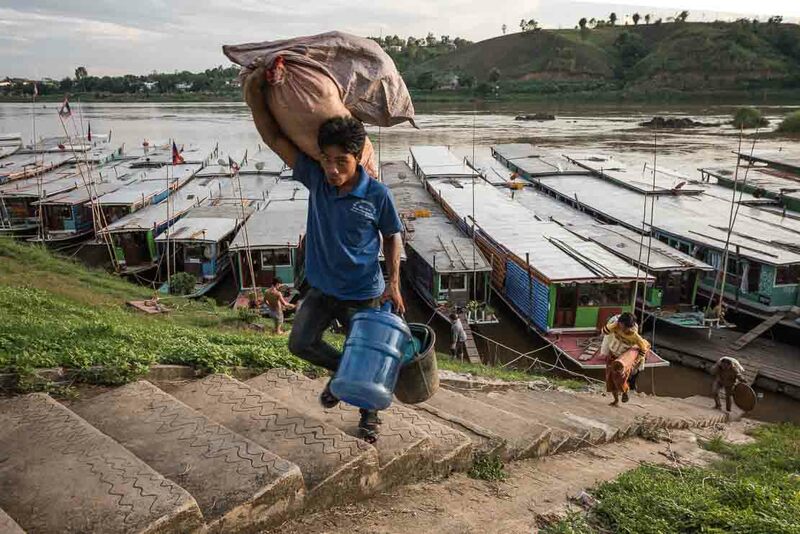 Due to the tourism boom in Luang Prabang, Pakbeng now see hundreds of tourists coming by boat in the evening and leaving early the next morning. 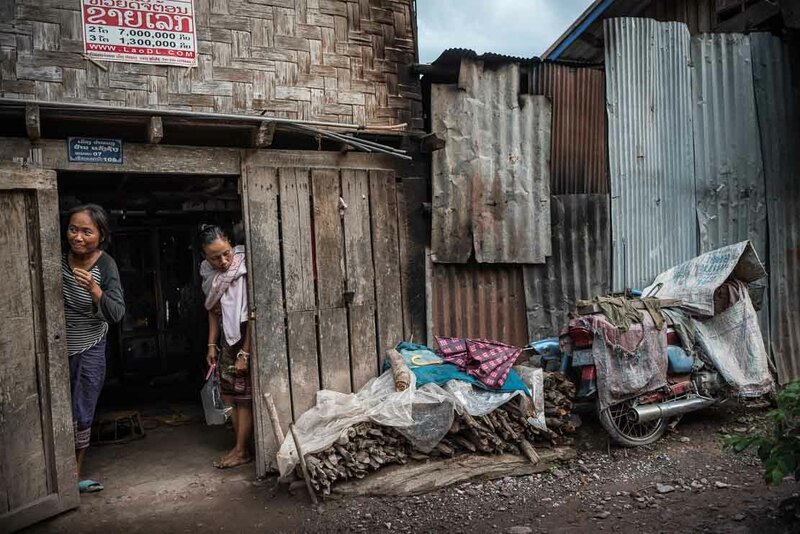 It’s not surprising to see new guesthouses springing up in Pakbeng like mushrooms. 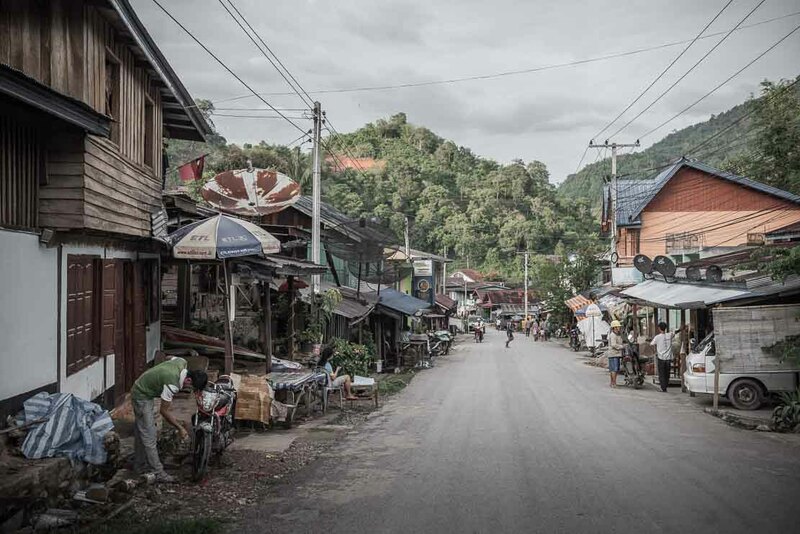 For many tourists Pakbeng is simply a transit point on their way to Luang Prabang. 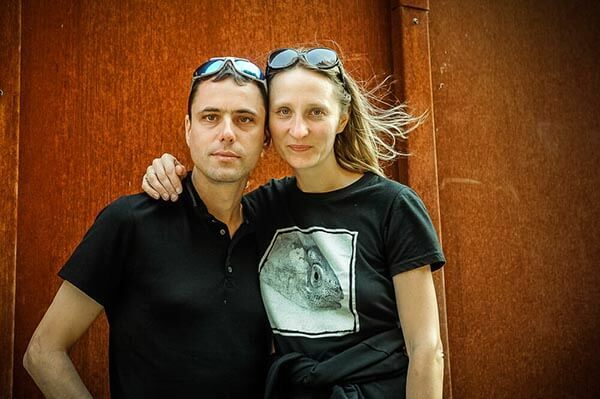 We read that it doesn’t have much to offer except guesthouses and restaurants. People usually stay there only for one night. 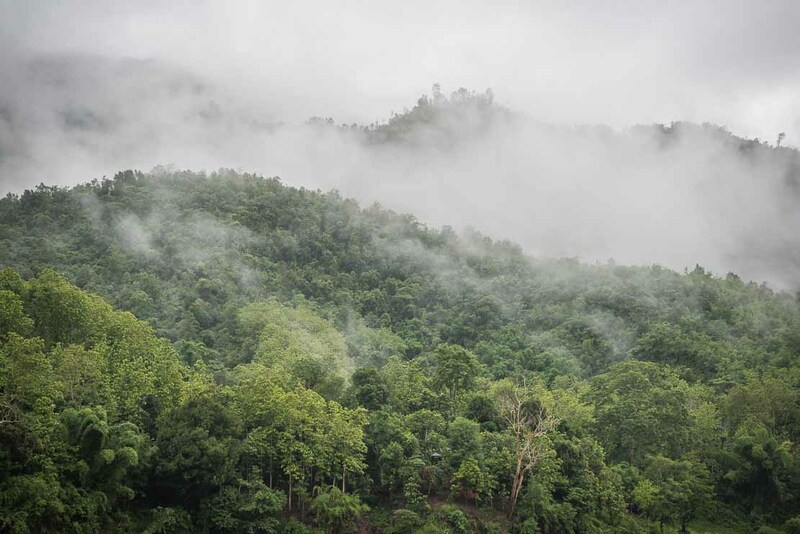 But we found Pakbeng quite pleasant to spend two or three nights and have a glimpse of the rural Laos. Many budget guesthouses along the main road offer a stunning view on Mekong. Our guesthouse, set in a scenic spot, had a large terrace directly overlooking Mekong river. Where else can you have this kind of view for such amount of money? Tempted by the view, we quickly decided to stay for longer than just one night. 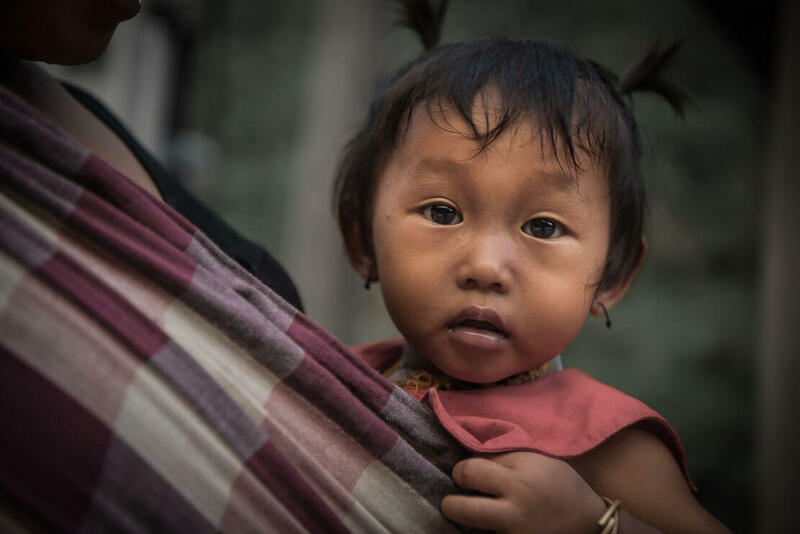 During our three-day stay in Pakbeng, we wondered the town and its surroundings, visited a temple overlooking Mekong, went to a small market, tried some local dishes in a few local restaurants such as bamboo soup and visited the elephant camp. 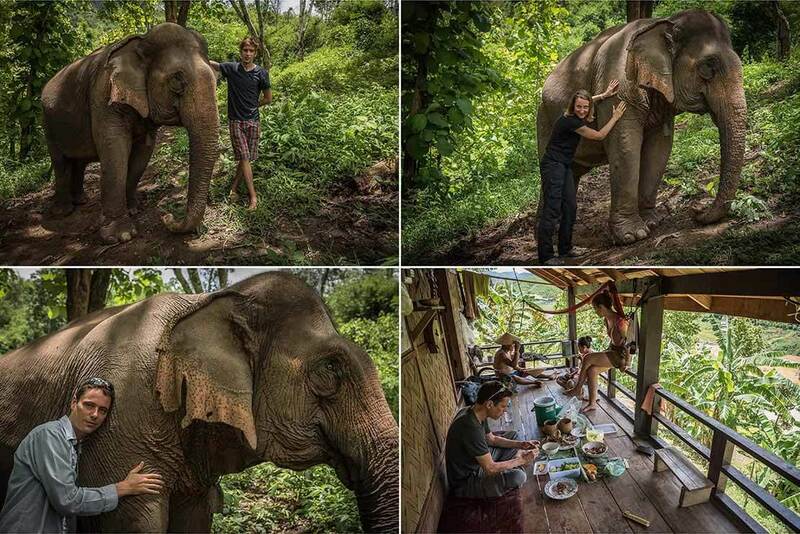 This isn’t a usual elephant camp where tourists can ride an elephant but rather a sanctuary, a rest house for these iconic animals. 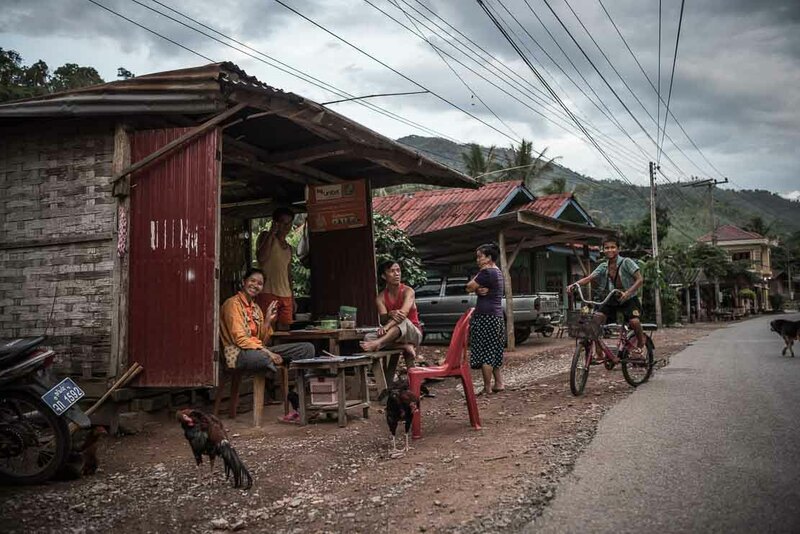 There’s not much happening in Pakbeng but it was interesting to observe the local life, feel the atmosphere of rural Laos and especially enjoy the amazing view from our guesthouse. It was also entertaining to watch the hungry travellers coming with the boat in the evening and making their way down to the boats the next morning. Finally, we decided to continue our journey to Luang Prabang. This time the boat was a bit smaller but offered the same comfort. Several hours have passed, and when the sun was low in the sky we were approaching the beautiful town of Luang Prabang. Plane: several flights per week from Chiang Mai (1h). This is the fastest but also the most expensive way. Bus: bus to the border, then bus to Luang Nam Tha, then Udomxai, and then Luang Prabang (total: 10-12h). 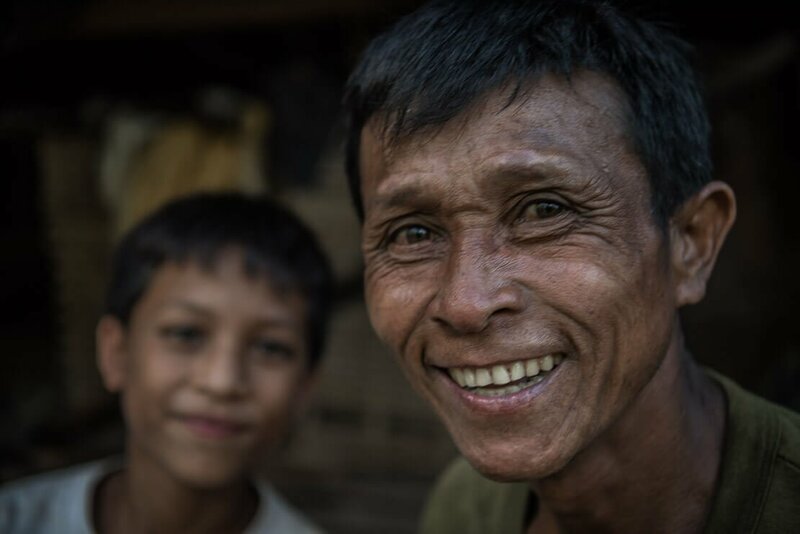 Slow boat: two days on the boat with the overnight stay in Pakbeng. 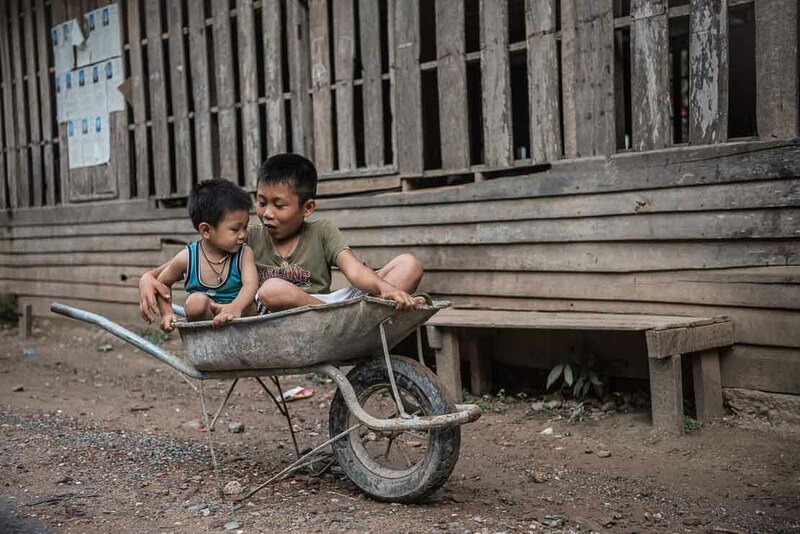 Alternative – take a truck in Pakbeng to Udomxai and then to Luang Prabang. Speedboat: one-day boat ride. This is THE DANGEROUS way to travel due to a high number of accidents. Private boat (luxury tour) or hired boat: definitely comfortable but expensive way of travelling. 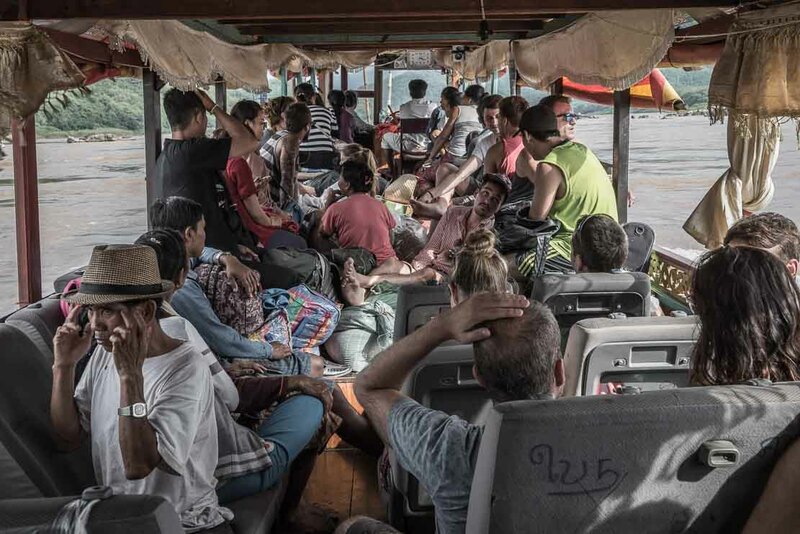 The new and easy way is a direct bus from Chiang Rai (Terminal 2) that goes all the way to the Thai-Lao border, drops the passengers who need to obtain a Lao visa on arrival, waits for them on the Lao side and then goes to the Lao town of Huay Xai. “Old” way is a bus from Chiang Rai to Chiang Khong, tuk-tuk to the Thai customs, another tuk-tuk after the Thai customs’ clearance to cross the Friendship Bridge (cannot be crossed on foot) to go the Lao customs for visa procedures. Once the visa is obtained, another tuk-tuk to Huay Xai. If before the border crossing was done by ferry from Chiang Khong, now the ferry can only be used by Thai and Lao. All the others must use the newly built Friendship Bridge located 11 km from Chiang Khong. Lao visa on arrival costs US$30 for most nationalities. There is an ATM on the Lao side and an exchange office. Thai baht are also widely accepted in Laos. 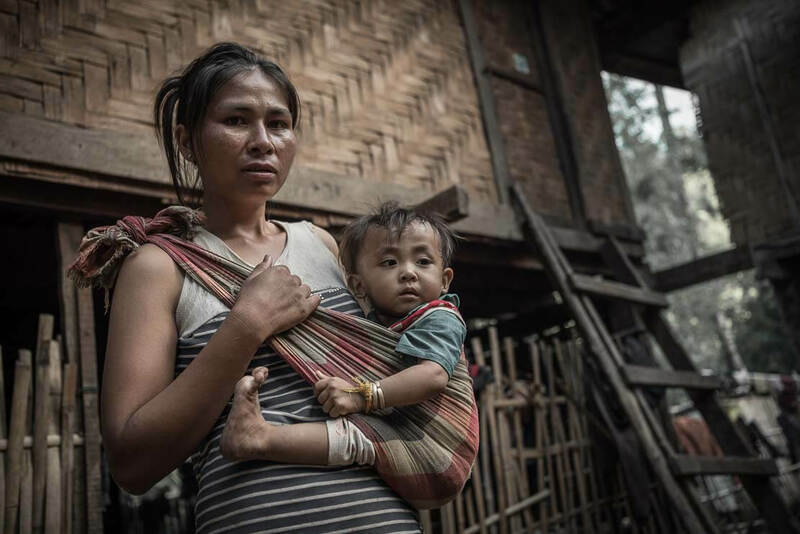 It takes two days to go from Huay Xai to Luang Prabang with the overnight in Pakbeng. It’s about 6-7 hours of boating per day. Slow boat per person from Huay Xai to Luang Prabang costs 220,000 kip (roughly 1’000 Thai baht) or 110,000 kip from Huay Xai to Pakbeng. If you bought a ticket to Luang Prabang but decided to stay in Pakbeng for a bit longer, your can get an extension of your ticket for one more day at the ticket office near the boat landing. Choosing the seats in front, you avoid the noise and smell of the engine. There are now ATMs in Pakbeng but we wouldn’t rely on those. There is nothing better than cash. Many restaurants and guesthouses accept Thai baht. Many touts meet the boats offering the overpriced guesthouses. Don’t listen to their stories about the guesthouses being fully booked upon your arrival or exaggerated walk-in rates. You will get a much better deal if you choose a guesthouse yourself, and there are plenty of them around.